Pitcaithly bannocks originally hail from Pitcaithly in Perthshire, and are quite like shortbread in consistency. 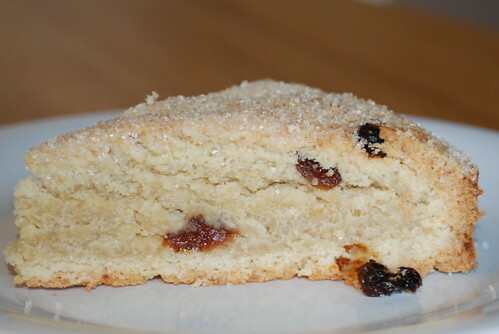 As with the Fife bannocks, there’s no fallaid left over so you can designate a farl to the Good Folk and break a piece off for them or set a small piece of dough aside to cook specially as the bonnach fallaid, either with a hole through it, or break a piece off as you offer it once it’s cooked. The first time I tried these (pictured left) I only had mixed raisins with peel but they turned out very nicely. Remember to adjust the temperature for a fan oven, though, because these cooked a little unevenly as the oven was too hot. The almonds give a texture rather than a taste, but if you don’t like them, try some semolina instead. 1. Lightly dust a clean surface with flour, ready for kneading the dough later on. 2. Cream the butter and sugar together in a bowl. 4. Turn the dough out onto the floured surface and knead until it’s nice and smooth, adding more flour sparingly, if needed, to prevent the dough from sticking to the surface. 5. Return the dough to the bowl and cover with clingfilm, a lid, or a towel and place in the fridge for about a day – a few hours will do at a push. 7. Place on a baking tray. If using the caudle, mix all the ingredients together and apply a thick layer to each cake with a pastry brush. 8. Bake in the oven for 40 minutes for a round, until golden brown, allowing less time for smaller cakes. Alternatively, bake them on a hot, greased girdle. If you use caudle, you will need to turn the farls over and apply a thick coat to the underside once the first layer of caudle has dried in the heat of the oven. This should take about five minutes. You can keep applying layers of caudle to alternate sides as the bannocks cook if you wish. 1 Recipe from Practically Edible.